What are the most popular online bachelor's degrees offered in Idaho? Idaho has belonged to the Western Interstate Commission for Higher Education (WICHE) for more than 60 years. The program has helped students save $144.3 million in tuition since 1988. Most of those savings come through WICHE's Student Exchange Program, which allows students to pursue certain out-of-state programs while paying in-state tuition. The program has provided Idaho with $51.7 million in savings in the last 5-years, a return 78 times larger than the state's investment in WICHE. Idaho is also part two other organizations that help students complete their education affordably. One is the State Authorization Reciprocity Agreement, which makes distance and online education courses more accessible for students. The other is the Consortium for Healthcare Education Online program, which allows distance learners to connect to web-based science labs. These programs are striving to improve enrollment rates, which have stagnated in response to decreased state funding in higher education. Idaho has suffered severe funding cuts in recent years, pushing a greater percentage of tuition costs onto students. That, combined with a 36.7% increase in tuition at public four-year colleges, has made online education an attractive alternative for residents. As colleges throughout Idaho and the region expand their online programs, the number of online students in the state should grow commensurately in the coming years. Surrounded by the breathtaking landscape of southeastern Idaho, Brigham Young University-Idaho offers a quality education rooted in the teachings of the Church of Jesus Christ of Latter-day Saints. Founded in 1888 by Latter-day Saint pioneers, the university strives to provide students with an exceptional academic experience that emphasizes the importance of both education and faith in higher education. A leader among online Idaho colleges, Brigham Young University offers more than 15 online programs and over 210 courses designed to meet the needs of busy adult learners. Classes can be taken year round, and the flexible online delivery method allows students to complete coursework at their convenience. To be eligible for enrollment in one of the university's competitive online programs, students must possess 15 completed hours from a Church Educational System or be graduates of Pathway, a one-year educational program that prepares students for the rigors of college. Founded in 1889, UI is the oldest university in the state and one of the best online colleges in Idaho. With more than 12,000 students, UI boasts on-campus options and seven online degree-granting programs. Of these seven online degrees, the school offers five at the undergraduate level. Students elect to take online courses full-time or part-time, depending on what their schedule allows. For admission into one of the programs, applicants from high school must meet the university's 2.5 GPA requirement. Admissions requires transfer applicants to possess a 2.0 GPA. All online students at UI, regardless of residence, pay the same in-state tuition rate. Idaho provides academic assistance to all students, including one-on-one tutoring, academic advising, and internship aid. Students also receive access to the online library and career services. Northwest Nazarene University is one of the best online colleges in Idaho, and its holistic, Christian approach to education provides students with a fulfilling professional and spiritual academic experience. The university's academic programs are rooted in the traditions of the Church of the Nazarene and reflect the school's mission to serve God through scholarship. Northwest Nazarene University offers several Adult and Professional programs fully online as well as a variety of graduate programs. Undergraduate programs range from business and education to Christian studies and nursing. Students can also choose to pursue an online associate or bachelor's degree in liberal studies, which provides an overview of general studies and prepares students for careers in academia, politics, non-profit management, and much more. Online undergraduate tuition rates are competitively priced, and students pay $315 to $395 per credit. Residency does not affect tuition rates, and Northwest Nazarene University offers several types of financial aid options. Known for its state-of-the-art football stadium complete with blue turf, Boise State University has as much to offer academically as it does athletically. Boise State University is conveniently situated in Idaho's capital city and is one of the leading online Idaho Colleges in the state. Online course curricula are guided by the belief that the university's current students will emerge as valuable leaders and scholars in a global society. Boise State University's eCampus was designed to provide students with an easily accessible alternative to traditional on-campus learning, and a variety of fully online academic programs are offered. Some of the innovative degrees available through the university's eCampus include multidisciplinary studies, imaging sciences, and nursing. Students must have prior educational training to be eligible for some degrees, such as the bachelor's of applied science which is designed for students who hold a technical associate degree. Previously earned credits can be transferred toward degree programs. Located in Lewiston, Lewis-Clark State College is one of the best online colleges in Idaho. Founded in 1893 as a Normal School for teacher training, the university has blossomed over the past 100-plus years into a bustling hub of intellectual enrichment with more than 3,000 students from 25 states and 34 countries. Lewis-Clark State College is a leader in online education and offers 372 online courses and nine academic programs. The university's online programs are led by experienced faculty with training in online instruction, and course delivery is powered by Blackboard. Online students have access to a multitude of services, including Blackboard Learn Support, online proctoring, technical support, and student success tools. All of the online programs offered by Lewis-Clark State College have been approved by the National Council for State Authorization Reciprocity Agreement, and prospective students are encouraged to ensure that their state is a member of the distance education authorization program. Our affordability methodology considers value-driven metrics and ranks schools that have low tuition rates, as well as proven graduation rates and employment outcomes that provide a high ROI for students. For students in Idaho, there are plenty of opportunities to find an affordable program locally. While distance education provides more flexibility than an exclusively residential curriculum, there are still plenty of advantages to attending a local online college, including access to lower tuition prices and local scholarships. If you're considering going back to school, and are thinking about studying online, the following list of cheap accredited online colleges in Idaho will help you start your search. Brigham Young University is best known for being the nation’s main Mormon college. The university offers over 20 online certificate, associate, and bachelor’s programs through its satellite Rexburg campus. Coursework is primarily asynchronous, making use of discussion boards and prerecorded lectures. Students receive plenty of instructor engagement and feedback. BYU-Idaho has stricter admission requirements than most colleges in Idaho: students must either have completed the school’s PathwayConnect course or at least 15 on-campus credits at a BYU branch. Transfer credits are accepted on a case-by-case basis. BYU-Idaho is one of the most affordable online colleges in Idaho for out-of-state students; all online students pay the same tuition regardless of residency status. All students can get a tuition discount by completing PathwayConnect. One of the Bellwether colleges in Idaho, Boise State University offers over 35 online bachelor’s, master’s, certificate, and endorsement programs. Striving for flexibility, the school offers most of its programs asynchronously. That flexibility extends to Boise State’s transfer policy -- the online school accepts all credits earned at regionally accredited universities. An online Boise State education is reasonably priced; all online out-of-state students pay the same flat rate as in-state students. As a result, Boise State is one of the most affordable online colleges in Idaho. There is no minimum GPA requirement for freshman applicants, but each applicant should have completed courses in core subjects -- English, math, natural science, social science, humanities -- during high school. Located in Lewiston, a former gold rush town, Lewis-Clark State College is named for the famous explorers Meriwether Lewis and William Clark. The school currently offers nine online associate and bachelor’s degrees. Each program delivers coursework asynchronously through Blackboard. LCSC has the lowest tuition of all four-year public colleges in the state, making it one of the most affordable online colleges in Idaho. Additionally, out-of-state online students may pay the same tuition rate as in-state students. Interested students should submit all previous transcripts, and freshman applicants should submit ACT or SAT scores. There is no minimum GPA requirement. LCSC’s online programs are not yet available in Florida, New York, Connecticut, California, New Jersey, and Washington DC. A private liberal arts college located in Nampa, Northwest Nazarene University offers 24 online programs, including associate, bachelor’s, master’s, and doctoral degrees. NNU strives for affordability, offering the same flat tuition rate to out-of-state and in-state students. As such, NNU earns its place as one of the most affordable online colleges in Idaho. NNU gives a great deal of autonomy to each of its programs. As such, elements such as admissions requirements and synchronicity vary for each program. Unlike many other colleges in Idaho, NNU is Christian-affiliated, specifically with the Nazarene faith. Students’ education will be grounded in a Christian worldview. A private for-profit college headquartered in Utah, Stevens-Henager College also has campuses in Boise and Idaho Falls. The school operates over 20 online programs through Independence University, an affiliated institution. Since IU designed its programs for working professionals, classes are asynchronous. Out-of-state and in-state students pay the same flat tuition rate, making IU/SHC one of the most affordable online colleges in Idaho. The school also offers a number of scholarships specifically for older students in order to make continuing education a reality. Freshman and transfer applicants need only submit their transcripts to be considered for admission. There are no minimum GPA requirements. Like many postsecondary institutions in the U.S., Idaho's schools have recently implemented more online programs to accommodate the increased demand for distance learning options. Tuition and fees at public, four-year Idaho colleges and universities have increased by 36.7% over the last five years, while state funding for postsecondary education costs dropped by 11.1% during this time. Accordingly, students pursuing higher education degrees in Idaho have turned to online programs, where tuition and associated costs are much lower. Disinvesting in higher learning in Idaho has also reduced the number of college-educated employees and job qualifications in the local economy. In response, The Idaho Board of Education set a goal that 60% of Idahoans ages 25-34 will have a postsecondary degree by 2020. Set in motion through various initiatives such as Complete College Idaho and the P-20 Statewide STEM Strategic Plan, this statewide plan is centered on promoting higher learning and revitalizing the labor force in Idaho's major markets. 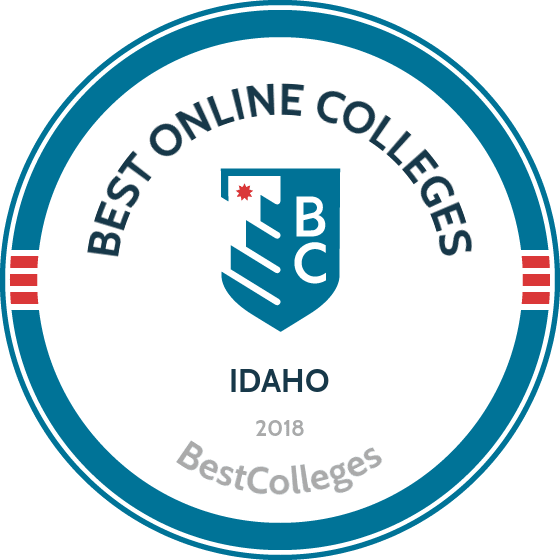 Browse our list of the best online colleges in Idaho for more insight into distance learning programs in this state. As of fall 2012 enrollment, NCES reports indicate that 12.6% (13,848) of students attending Title IV institutions in Idaho enrolled exclusively in online programs. For more than 60 years, Idaho has partnered with the Western Interstate Commission for Higher Education (WICHE) to provide higher learning opportunities for college students. Through a variety of WICHE initiatives, including those involved in distance education such as the State Authorization Reciprocity Agreement and the Consortium for Healthcare Education Online, Idaho students and learning institutions saved an average of $11.6 million in 2014-15. These initiatives support online learning and have contributed to the platform's growth in Idaho over the last decade. Employment growth in this profession is strong in Idaho. According to the Idaho Department of Labor, long term projections show an increase of 29% in the total number of jobs between 2014 and 2024. Wages increased by 2% from 2011-2016. In 2016, what were the top careers in Idaho for people who had a degree in business administration and management? Data source: Idaho Department of Labor, Bureau of Labor Statistics. Data may not be available for every year. Employment growth in this profession is strong in Idaho. According to the Idaho Department of Labor, long term projections show an increase of 69% in the total number of jobs between 2014 and 2024. Wages increased by 2% from 2011-2016. In 2016, what were the top careers in Idaho for people who had a degree in web page, digital/multimedia and information resources design? In Idaho, employment growth in this profession is strong. According to the Idaho Department of Labor, long term projections show an increase of 69% in the total number of jobs between 2014 and 2024. Wages increased by 5% from 2011-2016. In 2016, what were the top careers in Idaho for people who had a degree in registered nursing? In Idaho, employment growth in this profession is strong. According to the Idaho Department of Labor, long term projections show an increase of 55% in the total number of jobs between 2014 and 2024. Wages increased by 19% from 2011-2016. In 2016, what were the top careers in Idaho for people who had a degree in accounting? In Idaho, employment growth in this profession is strong. According to the Idaho Department of Labor, long term projections show an increase of 31% in the total number of jobs between 2014 and 2024. Wages increased by 44% from 2011-2016. In 2016, what were the top careers in Idaho for people who had a degree in general studies?